The story-line is quite gripping - the anticipation made it hard for me to put the book down. However, the transitions were sometimes rather fuzzy, and many events unfolded too quickly. More can also be done to introduce the characters, so that readers can better connect with them, and follow through with them on this intriguing journey. Furthermore, I couldn't quite understand the title of the book. Somehow I just can't see how it is related to the story. Lastly, more details could be given to paint a clearer picture of the events that unfolded as we progressed through the book with Skye and Drew.Nonetheless, I liked the idea of the Steppenwolf, which highlighted the ambiguity between Man and Beast (Though I got to clarify a little, most guys are not quite as sadistic as Drew). 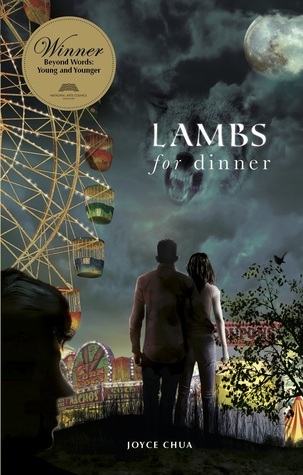 I also really liked the surreal atmosphere created in the universe of Lambs for Dinner, which made it even more mysterious.Overall, I enjoyed the book very much. I look forward to seeing a new novel some time soon! Lambs for Dinner is an enjoyable read in general. Despite some dialogues leaving me confused and certain links choppy, it was a pretty straightforward book that I didn't have to put too much thought into, especially after a long day at work.The feelings between Drew and Skye escalated too quickly for my liking to believe that they'd do so much for each other. Other than that, I could relate to most of the characters - how their pasts and beliefs affected the way they saw themselves and managed their relationships, how they came face to face with the past and the different ways each character coped, etc. There were certain things that I wish had been elaboration but I just left them to my imagination.I would like to end this by specially mentioning my favourite thing about the book: Drew's snark. His banters with Skye and Travis were great. I just love all things snarky. Not many people around me know and appreciate snark, so the amount of it in this book alone makes me giddy. It hooked me and compelled me to read on and on to see what's going on and what's going to happen next. The writer's done a great job getting under the skin of the characters to convey their conflict and insecurity. A good read. I gave this book 2 stars, but it's more of a 1.5 stars for me. This novel should probably have dwelled longer in the editing/development stage because it feels like it's not far from a first draft and hastily published. I'll give some reasons why: 1. This is a romance YA, but the main romance is really boring, as if it's only there because it's there. For the plot. Drew and Skye meet, he immediately gets into a fight, and he's either fighting or wanting to kill someone or saving someone 75% of the time in this book. Skye feels safe around him, and I'm not surprised because she has to play the prime damsel-in-distress throughout the entire book. She is saved not once, not twice, but thrice by Drew, and once at the end by someone else. She is denied the chance to save anyone (though predictably she 'saves' Drew from himself, and she did save someone a long time ago), and she plays the helpless victim again and again. She's dragged into a pool, she's dragged into a rollercoaster, this poor girl needs to learn some self-defence and start learning how to throw her weight around. Oh and their past(s) are tied together which is why they had to be made to fall in love. To me it wasn't a convincing love and they didn't have enough of a YA Romance spark to really buoy the rest of the story. Which brings me to...2. The dialogue. It is so stilted and rough in some places. When there are three characters having a conversation, it becomes hard to keep track of who is saying what. Sometimes, the author inserts a new person into the conversation but it's not clearly done and it's very jarring. The main problem is lack of description with the dialogue, but also the speaking styles are all really similar.3. Plot dramatics. Tragic back stories abound and all adults are the Enemy. Also, your ex-best friend tries repeatedly to kill your girlfriend. And you use your fists to solve your problems but it's ok since you are a Wolf-beast-thing, but only metaphorically. It gives you license to kill people. Even if you try to kill someone, such as burning their house down (with them in it) and/or putting them on a rollercoaster with no safety rails, IT'S OK u will get away with it. Where is the law enforcement in this town? It feels so surreal to read about a kid going around trying to kill people, and the people he tries to kill are like "haha nbd he just needs love and forgiveness" ie. "he's not evil just misunderstood".4. The notion of "I don't believe in walking out of someone's life" is problematic for so many reasons. Frankly, it is an immature policy to stick to. There is such a thing as toxic people, and people you should walk or run away from, yet the message in this book is preaching forgiveness towards people who literally try to murder you. (?!) Because they are a part of your past and your past is a part of you and so on. The blanket statement needs to be more nuanced. It's really disturbing that this is the character arc for the two main characters. I have to say I am totally baffled by this book, especially for a YA one.If the plot hinges all on the concept of Steppenwolf, then it is extremely bad because the location is obviously some imaginary place and I wonder if that world even knows Steppenwolf?The sense of place/point of references is disjointed. The author's voice isn't consistent and the quality of the dialogue is stilted.One can only question the wisdom of the publisher/arts council for awarding it as a prize winner for a YA competition 2 years ago. I can't even award it a star because it is just weird. Joyce Chua - After her first taste of creative writing when she was twelve, Joyce has been hooked on telling stories. A recent graduate of the National University of Singapore, where she majored in English Language, she has been writing fiction since she was thirteen and has written too many manuscripts that should not see the light of day. These days, she focuses on young adult romantic fiction and is currently working on an urban fantasy novel. She occasionally rants and raves about her writing journey on her blog, which she welcomes you to visit at: thewritesofpassage.wordpr.